Just as we closed the doors to the clinic and finished up our Saturday morning consults, the afterhours emergency phone rang and I had to go treat a horse with a huge flesh wound. It was the sweetest horse and he cooperated so well with the whole process. As I was ready to leave the property, the farmers casually asked me to have a quick look at this ewe. It is so funny how predictable farmers can be. They always have a few other cases lined up for us to have a ‘quick’ look at. I personally find most farmers to be very genuine people and will happily give in to their requests. There I was staring at a mob of ewes from a distance and the owner kept pointing out one of them to me. She said that the ewe had developed a very large swelling under her abdomen but was still eating and drinking well. As far as she could recall, the lump had been there for many months and had not changed in size. The ewe had not recently lambed and was not in lamb (pregnant). She was wondering what the lump could be. The mob of ewes were pretty skiddish and that made it very difficult for me to have a close look at that particular ewe. When I suggested catching the ewe for a closer quick look, the farmer burst out laughing. She said it was impossible for us to catch the ewe at this very moment and it would take a few hours to organise that! I definitely established she was a healthy ewe with a very large swelling under her abdomen. My first thought was: she must have a hernia! I took pictures of the ewe and explained the only way to confirm the diagnosis would be a proper examination and hernias would require surgical repair. The other possibility was an abscess (lump full of pus) but I would have expected the ewe to be very sick by now. Then the farmer asked if I recommend culling this ewe. I stuttered and replied: ‘There is no need to rush to the decision of culling the ewe. She has had the lump for several months and is bright and happy. Leave it with me, I will contact my mate from Norway who regularly treats sheep and get her second opinion on the photos and get back to ya!’. 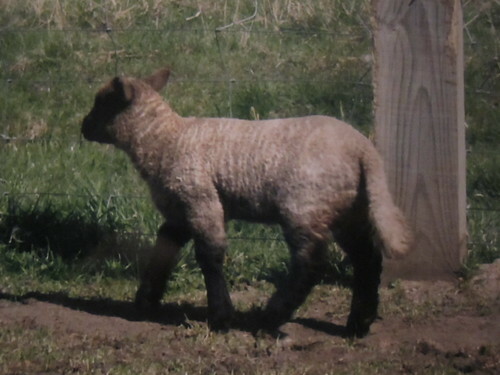 I followed through with my promise and emailed my mate the pictures of the ewe and history and asked for her second opinion. In Norway, every sheep is considered very valuable and farmers will readily seek veterinary attention if any of their sheep are ill. Unfortunately that does not apply to Australian sheep farmers because they run heaps of sheep on massive properties and unless they are losing sheep in the dozen, they would never call out a vet. This is a generalisation and so does not apply to every Australian farmer. I was secretly hoping my friend from Norway will offer me all the solutions to my ewe dilemma. She promptly replied supporting my suspicion of hernia in this ewe. She said the herniation is probably due to a ruptured ligament leading to intestines/organs poking through and just being held in place by skin. In Norway, they call it “vom i skinn” = “rumen in skin”. Heavily pregnant ewes or ones that have recently lambed seemed predisposed to developing hernias in Norway. 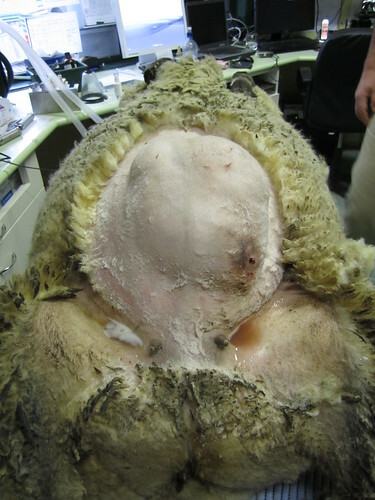 She, did however, think the location of the herniation in this ewe was particularly odd. 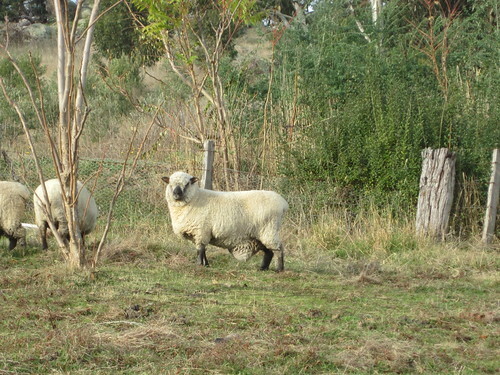 They usually herniate to either side of the ewe’s abdomen not below its midline. Again she could not rule it out the possibility of the lump being an abscess. To my utter dismay, she then proceeded to explain they usually recommend culling these ewes as it is not cost-effective to treat them! I was simply shattered to hear the news because Norwegian vets usually get to do c-sections on ewes and all kinds of procedures to save them but this was not one of them! I picked up the phone and called the farmer and explained that even in Norway, they would recommend culling this ewe if she was confirmed to have a hernia. I was well aware the farmer was not keen on doing much workup for this ewe but pressed on with discussing all the options. I told her it is important for us to examine the ewe to determine if it is an abscess or hernia or possibly even a tumour and only then can I give her my appropriate recommendations. ‘You sound very passionate and keen to give this ewe a good go, would you like to operate on her to see if you can save her so long as the procedure is pro bono (i.e. no charge to her) and no strings attached if it doesn’t survive? She was well aware of the risks and simply happy to give me a crack at trying to save this ewe. I was instantly filled with excitement and said:’Yes I would love to take you up on this great offer!. Judgement day arrived. Sue dropped off the ewe and wished me luck with the procedure. 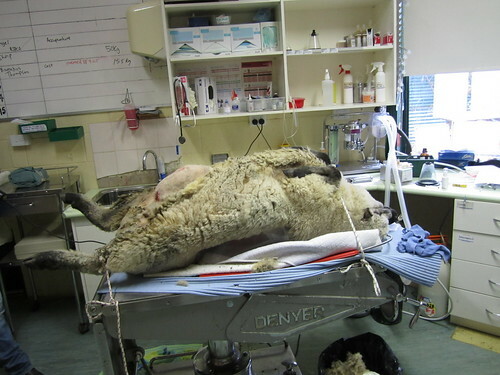 We proceeded with putting the ewe under full anaesthetic. Check out the pictures below. It was a pretty spectacular ventral abdominal lump and it felt hard and I was not really able to reduce it (push it back) to confirm it was a hernia. I then stuck a needle in it and got some pus and that was indicating the lump was an abscess. It was still very confusing at that stage and we were quite unsure about what we were dealing with. Finally I cut into the lump and voila, I saw intestines and confirmed it was a hernia. 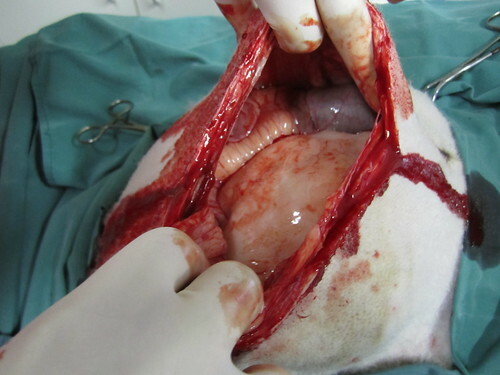 What followed was a very tedious job of trying to repair the abdominal wall. I had to drag Alana, one of my colleagues, into surgery to assist me in putting this together. It was one of the most difficult and exhausting surgeries I have ever performed and I could see why the Norwegian vets considered it not viable to routinely do. It took us a total of four hours to suture the linea alba back together and replace the abdominal content in their correct position. Just as we were recovering the patient, one of my bosses passed through and said: ‘Wow it still looks like a hernia even after you have repaired it’. Let us just say my boss was lucky to be my boss because if he wasn’t, I may have strangled him at that particular moment in time. He was right in the fact that there was still obvious swelling there but nothing like before and the intestines were back were they belonged (in the abdomen). 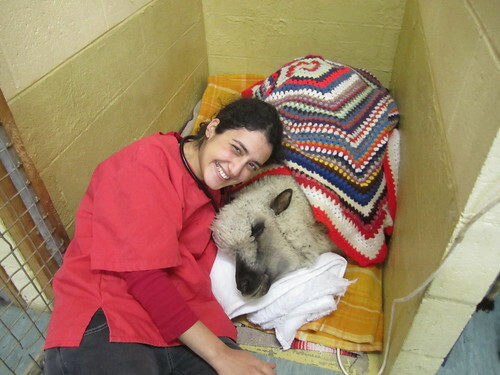 I was so happy that my ewe survived the four hours of surgery and recovered so well from her anaesthetic. I called the owner to tell her the great news and she was baffled. 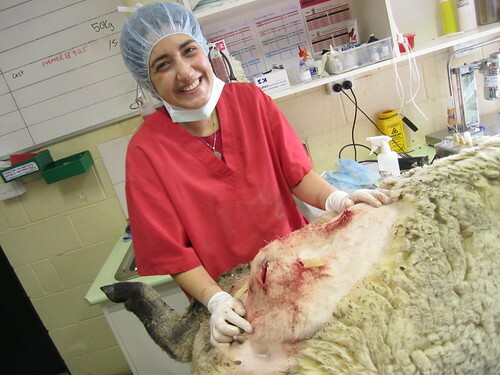 She had not expected to pick up the ewe as she suspected she would not survive the procedure. She drove in to pick her up and was so touched by how I kept referring to the ewe as ‘Possum’. The ewe was by no means considered a pet by this owner. However, Sue decided to name her ‘Possum’ as a thank you for my hardwork. We thoroughly discussed the post operative care and I strongly emphasized the importance of not breeding from this ewe as she will most definitely herniate again. ‘Possum’ recovered really well and the owner kept me posted on her progress over the next couple of weeks. A few months later, I kept getting messages from Sue demanding I call her back URGENTLY. My heart was beating really fast when I finally got a chance to return her call. As soon as she heard my voice, she said: ‘Rayya, guess what?’ Possum had the most beautiful little lamb?’ ‘Possum must have been in early pregnancy when she had undergone the massive surgery. ‘Possum’ had defeated all the odds, survived massive surgery, hung on to her pregnancy and given birth to the healthiest and most adorable looking lamb. Sue kept saying that Possum’s lamb was bigger and healthier than all the other ones in the mob. She was absolutely thrilled and told me she named the lamb after me. The price of this precious lamb was the evaporation of all my efforts to repair the hernia. Possum had re-herniated post-lambing. Her lamb had consequently learnt to suckle from an abnormally positioned udder which was pushed backwards by the hernia. Moral of the story, I won’t be operating on possum again, that’s for sure! I just feel so privileged to have been involved in indirectly saving two lives not just one-a ewe & her unborn lamb! What a Happy ending, although I am sorry Possum herniated again. Can she live with the hernia, or is this “the end” for her? I presume they don’t breed freely so her owner can make the decision, but will she keep a sheep around that doesn’t breed? Thanks for the photos of the hernia! PS: I made an afghan just like that! How wonderful that the lamb survived! And you got some tiring but valuable surgery experience. I will hope for the best for Possum. Well done Rayya 🙂 Such a cute lamb, and she’s alive because of u! Yay! Fascinating post and an amazing that she went on to have a lamb. You have such an interesting and satisfying job! Glad you enjoyed the post :-)…my job is definitely very interesting and can be very rewarding! What an amazing story! I love starting my day with one of your great posts. Best wishes to Possum and her baby! It really makes my day to hear that my post put a positive spin on your day :-)…I was on cloud nine for a whole week when I was told lamby was born. What a great story, so glad you had a positive outcome. What a great story and such a wonderful outcome, thank you for sharing! Fabulous post and fabulous photos, though Possom may not be too thrilled you have passed the nes of flat on her back around the world! What’s her long term prognosis now she has reherniated? You are absolutely correct, Possum would not be impressed at all but thankfully she doesn’t have great internet access on the farm :-). Hey Nicole. You should just call me Rayya :-). I am psyched to hear that my article heightened your passion for sheepies. here’s the link! . . .
What an interesting story. I was sorry to learn that Possum has reruptured though. I love the photo of you with the ewe covered in the bright afghan! Dr. I’d a very similar clinical case to yours. Absolutely similar..the same protocols, procedure, idealogy..everything. The only diff. is I lost my own patient 3 days post operation. But the surgery was successful. I’d to use mesh to close the hernia ring. Pls I wil like to learn more procedure from you. Anyway yot can help me,Pls do . I want to do my master studies. Pls advice me. I love Vet. Med so much. Well done on trying and unfortunately we don’t always have success with all the cases. 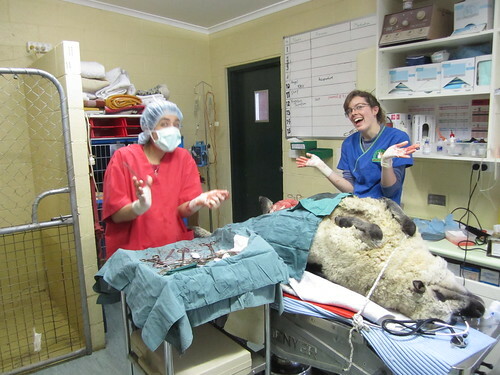 In my particular case, the ewe did re-herniate so my surgery was obviously not a complete success. I suspect your ewe may have died from infection or poor recovery from the anesthesia. It is hard for me to comment without the full medical history (drugs used, duration of surgery or etc). Again I really can’t give you any guidance on where to do your master as it depends where you are applying and this requires a lot of research that you need to do. I wish you the best of luck in your pursuit of your veterinary studies. This blog really helped me as I just bought a Nubian Goat and some how she got injured on the way home with two small hernia tares in her abdomen. She is due to have kids in the next 6 weeks I was told. My vet said not worry about it right now because she would most likely re-herniate while giving birth. She said I can deal with it after she births the kids. I hope she makes it. I like your story and it gave my hope.